The global material handling market is growing exponentially on the back of growing e-commerce business and container traffic on airports and marine ports across the globe. Material handling involves managing the storage and logistics of goods & products to manufacturing facilities, distribution centers, and warehouses. Booming e-commerce industry has significantly augmented the material handling equipment market size owing to escalating need for faster deliveries to better cater to the consumers’ demand in the competitive landscape. Many major players in the e-commerce industry are installing warehouse management system (WMS) for real-time monitoring of inventory levels and to categorize the stock locations. Increased attraction can be seen in end-user industries to procure advanced material handling equipment on lease or rent. Thus, rental based material handling equipment would push the end-users to use advanced material handling equipment. Goldstein Research analyst forecast the global material handling equipment market to expand at a CAGR of 5.2% during the forecast period 2016-2024. The demand for material handling equipment in various industries around the world reached USD 82.6 billion in 2016, which is likely to reach USD 124.5 billion by the end of the forecast period. The report covers the present ground scenario and the future growth prospects of the material handling equipment market for 2016-2024 along with the total revenue of material handling equipment industry in every region. We calculated the market size and revenue share on the basis of revenue generated per segment, regional and country level. The revenue forecast is given on the basis of the number of material handling equipment manufacturers and current growth rate of the market. Based on end users, the manufacturing sector accounted for the largest revenue of about 40% in global material handling equipment market in 2016. Moreover, due to the huge increase in demand for products of the e-commerce industry, the retail segment is anticipated to account for the highest growth rate over the forecast period. Global Material Handling Equipment Market Outlook 2016-2024, has been prepared based on an in-depth market analysis from industry experts. 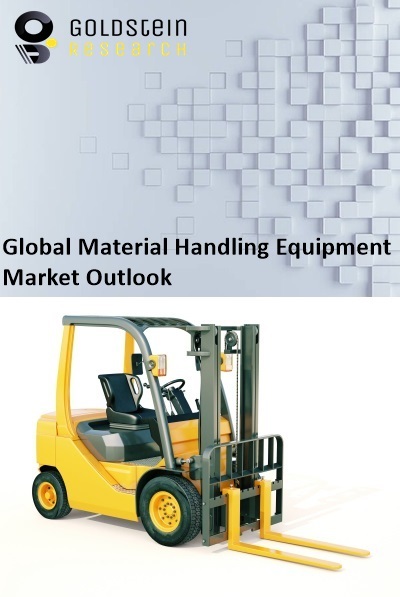 The report covers the competitive landscape and current position of major players in the global material handling equipment market. The report also includes Porter's five force model, SWOT analysis, company profiling, business strategies of market players and their business models. Global material handling equipment market report also recognizes value chain analysis to understand the cost differentiation to provide a competitive advantage to the existing and new entry players. Our Global Material Handling Equipment market report comprises of the following companies as the key players in the global material handling equipment market: Beumer, Daifuku, Kion Group, SSI SCHAEFER, Vanderlande, Clark, Crown Equipment, Columbus Mckinnon, TOYOTA Material Handling Company, Mecalux S.A. and Murata Machinery Ltd. According to our global material handling equipment market study on the basis of extensive primary and secondary research, one major trend in the market is the rising adoption of automated or robotic material handling equipment. Around 20% of warehouses across the globe are automated and these automated warehouses use some sort of material handling automation such as conveyors, sorters and other mechanized equipment to upturn their efficiency and to improve the productivity of the existing workforce. Advanced robotic systems and their ability to increase productivity and profitability, are anticipated to propel the growth of global material handling equipment market. According to the report, a major driver in global material handling equipment industry is rapid urbanization across the globe. Half the global population now resides in urban areas, and this trend will continue marching forward. Retailers will need to transport smaller quantities of a wider range of products to more distant and remote locations to meet consumer demands in nearby future. Rapid urbanization and booming e-commerce industry is the major driving force for the growth of efficient and reliable material handling equipment. Further, the report states that one challenge in global material handling equipment market is the high initial investment and high maintenance cost expected to hinder market growth over the forecast period. Geographically, Asia Pacific region accounted for the largest market share of more than 35% revenue in global material handling equipment market. Growing manufacturing units in countries like India and China will amplify the application of such equipment over the next few years. The Asia Pacific region is projected to grow at a CAGR of around 7% during the forecast period. On the other hand, Europe is closely followed by the Asia pacific region, which occupied about 28% of the market share owing to the presence of big automotive industry players and huge automobile production in the region.